Winner Casino Review (2019) ++ Is Winner.co.uk Legit? Take a Look! The Professor’s Winner Casino review receives a timely update, with multiple upgrades being enforced since the initial rating. The inclusion of PayPal, a UKGC license and a big GBP casino bonus are just some of the improvements that have been spotted, with the standard information such as free spins, bonus terms and security found here. Everyone wants to be a winner—especially when online casinos are concerned. The Professor is not really sure, though, whether he wants to play at a casino who call themselves the winner as he would much rather be the winner himself. This would, in turn, make them the loser in the equation! Still, our dear old guru does agree that it probably would not be the best kind of branding – to call your site Loser Casino. As Winner Casino was established in 2009, they have been making people happy with their games a lot longer than others. Still, age doesn’t necessarily guarantee class, so are they the right option for you? There are many casino site bonuses which differ from platform to platform, and the Professor would be lying if he said that he did not prefer casinos with great bonuses. In fact, finding the best and hottest promotions is what he loves to do, both in his spare time and while he is working. The welcome bonus at Winner.co.uk is pretty big no matter where your location. NOTE: The ROW no deposit bonus offer is available only for the players from the following countries: Austria, Canada, Germany, Finland, New Zealand, Norway, South Africa and Sweden. Since the folks at Winner have been in the industry for such a long time, all players can expect all kinds of goodies after too. These include extra Free Spins, Winner Points and more. Overall, we think that they have done a pretty nice job here, but let us know what you think within our reader Winner Casino reviews below. N/A – There is no Winner Casino bonus code to remember for either offer. Although there aren’t any Winner.com free spins available within the welcome package, some may appear as part of additional Promotions or the Winner VIP program (more on those shortly). However, for non-UK gamers, the no deposit bonus is probably better than free spins. Why? Well, you can use this bonus on many casino games rather than being restricted to just a few. You have to wager both your deposit and your bonus x35. The €30 no deposit bonus is valid for one hour after activation and needs to be wagered x50. The maximum bet when playing with a bonus is 10 euro (!) per spin. You have 3 days to complete wagering from deposit bonuses. While this might not come as a shock to most of us, the usual minimum deposit for online casino bonuses stands at only £/€20. Thus, some of us might feel compelled to deposit a bit more than we are used to. Although the above welcome offers are rather large, they won’t be around forever. As such, there are a few extras to have if you continue to play. There’s nowhere else to start than the Winner VIP program. 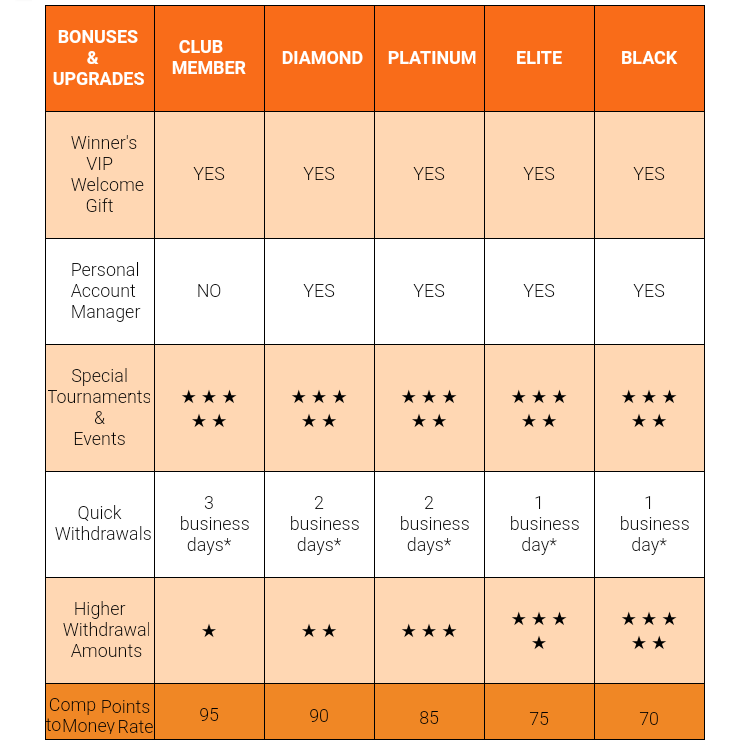 A total of five different levels exist, with perks including a personal account manager, access to special tournaments and events, faster withdrawals (see below), higher withdrawal limits and more. If you’re more of a casual player then Winner.co.uk have standard Promotions. Free spins are to be expected, but cash tournaments and raffles can appear too. If you reside in other regions then more localised methods exist too – such as EcoPayz, Trustly and Sofort. You may have noticed that we mentioned how Winner.co.uk is an authorised PayPal casino site. Hurrah! Not only does this add a lot more convenience, but it also speaks volumes about their safety procedures. After all, PayPal don’t team up with casino sites unless they’re particularly secure. Although these certainly aren’t the fastest responses the Professor has come across, it means you’ll access any wins within a reasonable timeframe. As just Playtech and Quickspin are utilised, there are only just over 100 slots for British players to enjoy at the time of writing. This isn’t great considering how other casino sites have into the thousands, and the Professor was disappointed to see that big UK favourites – such as NetEnt and Microgaming – were nowhere to be found. One positive aspect would be the filter system in place, with gamers able to search depending on a number of factors. If you’re not familiar with Playtech and Quickspin slots then this would be a good place to start. There are separate sites for sports betting, poker and bingo that you can switch between. A separate tab takes you to Winner.co.uk Live Casino. It’s also pretty much your bread and butter here too, with Live Roulette, Blackjack, French Roulette, Unlimited Blackjack and 7 Seat Baccarat your choices. Winner mobile is a good experience, if not necessarily a great one. The way the desktop version is built ensures that it slims down to mobile and tablet screens quite nicely. You can easily use the tabs to navigate while signing up for a new account is quick and easy. For Apple fans, there is a dedicated Winner Casino app for iOS users. Simply search the App Store to find it. Android fans are, unfortunately, not so lucky. However, ALL Winner Casino mobile players can use their device’s browser to play with no bother. But wait, there’s a specific app for desktop? Correct! The Prof isn’t quite sure why you would, but you can download a Windows PC app to do everything you can in a browser if you’d like. As this domain has been in the business for such a length of time, this stands them in good stead security-wise. When the Professor first conducted his analysis, a gambling license from the Malta Gaming Authority had been acquired. During the time in between this Winner.co.uk review update, they’ve also added a certificate from the UK as well. They have no recorded sanctions on their UKGC license. The Professor himself hasn’t experienced any foul play here, and the site’s longevity speaks for itself. They provide players with average monthly payout statistics (GLI Europe – Winner.co.uk) and have dedicated responsible gambling pages and tools. There is a somewhat long list of restricted countries at Winner Casino. These include: Aland Islands, Antigua And Barbuda, Australia, Bahamas, Barbados, Belgium, Belize, Bulgaria, China, Columbia, Cuba, Cyprus, Czech Republic, Denmark, Estonia, Dominica, Faroe Islands, France, Greenland, Grenada, Guyana, Haiti, Hungary, Hong Kong, Iran, Iraq, Israel, Italy, Jamaica, Latvia, Libya, Macau, Montserrat, Netherlands Antilles, Poland, Portugal, Serbia, Romania, Singapore, Slovakia, Slovenia, Spain, Sudan, Suriname, Syria, Philippines, Netherlands, Trinidad and Tobago, Turkey, Ukraine and United States. If you’re a fan of Playtech, PayPal and a big casino bonus, Winner Casino arrives highly recommended. The fact that British players are now accepted is a huge plus, although work still needs to be done on adding more games and providers. There are a few other teething issues to be solved which hopefully will be rectified the next time this review is updated, but Winner.co.uk have made significant steps forward. Take advantage of the welcome bonus to get started, and don’t forget to add your opinions after a few sessions! LOVE that you can use paypal! So quick to deposit with. Just hoping it will be as quick to withdraw if I finally manage to win something!! PayPal casinos are my favourites to play at – it just makes everything so much easier! If you manage to land any winnings, Winner Casino aim to process your requests within 3 days. PayPal transactions then take a maximum of one day. Hope this helps!